Discussion in 'Classic Muppets' started by bingboingcutie, Jan 19, 2011. 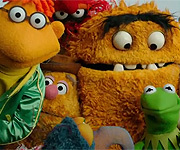 When you first started out as a Muppet fan, what mistakes did you make, if any? Ever mispronounced a character's name or go around telling other Muppet fans what a great job Dave Goelz did on Marjory the Trash Heap's voice? *I thought Scooter was a real "gopher". LaniArianna, ShanaynayXD and Muppet fan 123 like this. * I ranted at a friend about how great "Steve Whitmore" and "Dave Golaz" are. I then learned that's not how you pronounce their names. * Definitely thought Uncle Traveling Matt was Jim Henson for a looooong time, then recently I recognized Dave's voice in one of the lines and realized I was wrong. Dominicboo1 and Muppet fan 123 like this. Enjoy Muppet fandom! You'll love it around here! I've loved SS for my whole life, but I only came back to Muppets again in the past couple of years. *For almost my whole life I pronounced Snuffleupagus snuffleufagus. I thought Gladys from Sesame Street was a male character, lol. Yes I know she was a cow, but she did sound like a guy. In Great Muppet Caper, I thought Piggy really was a highly successful model and not just faking it. What can I say, I was a kid and I believed her! Well i've literally been a Muppet Freak since i was a baby (seriously - my parents definately noticed how strongly i responded to them pretty much right away) so lots of my mistakes were due to my young age along with the "newness". But some i remember are originally thinking Fozzie's name was "Fonzie", Gonzo was "Gongzo" (hey- he always was trying to hit the O in the logo like a gong, after all!) and that Biff and Sully were "Biz and Silly". I also though Grover was a girl for the longest time. And until i saw the rerun of it the year after TMS finished its run and all 120 episodes were shown again, i had remembered the Valerie Harper episode as the one where George the Janitor fell in love with Miss Piggy. ~ I originally thought Steve Whitmire's name was pronunced: White-mire. Now I know it's Whit-mer. Actually, that's all I've got. But I've made my mistakes! I joined MC as Bovegard...thinking that was how Beauregard was spelt. I used to think Elmo was a girl and was shocked to find he wasn't. I too used to call Steve Whitmire, Steve Whitemere...even when I was a founding member of SWAEHB. What's SWAEHB? Does it have to do with Steve Whitmire? Is it a club? Is Steve Whitmire a member? Also, for a long time I believed Gonzo was a bird. Feathers, beak...and I was TERRIFIED of him! And about Scooter: I always thought he was a gopher who had his little holes he dug all over inside the theater (and he wasn't employed there; he just dug his holes and didn't care if others minded), and, much to everyone's annoyment, gave mean comments and complaints to everyone everywhere he popped up...I think I was thinking about a mix of Scooter, Statler & Waldorf, and Gopher from Winnie the Pooh. As for me, about GMC, it isn't a mistake (or maybe it is...), but the first time I watched it and got what was going on, I saw Nicky at the Dubonnet Club and thought he was so silly. Then I saw him next to some sort of door and wondered, "What's he doin there?" It was only until another fan watching with me mentioned he was evil that I understood and thought, "Oh, no! Not him! Why him? He's so silly and funny, it can't be!" ... When I first saw Sprocket on A Muppet Family Christmas, I thought he was a real dog until someone told me that he was a puppet. The magic of Steve Whitmire. I also always thought that Joan Rivers said, "I had some boy turn on myself" rather than "I had some bad tuna myself..." after Piggy said that her frog turned on her. SWEAHB is a fan thread on this board dedicated to Steve. It's in the Henson People section. Hope that helps! I was slightly the opposite actually, lol, I knew Nicky was the bad guy, but I completely missed how silly and over the top he was supposed to be. To my 5 year old eyes, I thought he was the suave but deadly type, lol. It's sort of like the old Batman TV show, when you're a kid you don't realize it's supposed to be funny, lol. Wait...He's NOT a real dog? ? ? ! ...it wasn't until about the third of forth time that I watched it that I even realised why he went and unlocked that door. Same for me! In fact, the last time I watched was the first time I got it...I think I got something else this time too. ...and yes, I could barely believe my ears too...ain't he lifelike? I was over at my friend Wes' house and he pulled up Muppets Bohemian Rhapsody on his computer. We were laughing at Animal. Another friend, Steifon, commented, "What will the Muppets do when Frank Oz dies?" Now, I was knowledgeable enough to tell them that Frank no longer performed with the Muppets, which was news to them. Wes started to make a snarky comment about how I knew way too much about the Muppets, but his wife nipped him in the bud, which was funny. But I felt bad a few days later, when I realized I had called Frank's successor as Eric "Jacobian" by mistake. It was very bittersweet... why act like the authority in the group on a given topic if your information is unreliable? If I had it to do over again, I probably would have framed my answer differently. Maybe something like "Well, they survived the loss of Jim. They'll definitely bounce back without Frank." Something upbeat, devoid of my own ego's need to spout slipshod facts in a failed effort to seem knowledgeable. "Well, we can't ALL be perfect." Don't feel bad...I called him "Eric Jabson, the guy who plays Grover" for the LONGEST time. And as for Nicky Holiday, when he unlocks the door... I can't BEGIN to tell you how many times I watched it thinking that he unlocked it, opened it, closed it... and LOCKED it again. Which made the whole shot REALLY pointless. Those are all the mistakes I can think of at the moment... But my cousin was in his thirties when we had to persuade him at a family party that Big Bird was a boy, not a girl. Our argument? We had enough Sesame Street books where Big Bird was referred to with male pronouns. His argument? "But she has a NEST! Why would a BOY have a NEST?" I always thought Miss Piggy was voice by a woman (this goes to show how well Frank and Eric do female voices). I also thought Boober Fraggle was voiced by Frank Oz, instead of Dave Goelz. I also thought that Fran Brill did all the female puppet voices on Sesame Street (didn't have a clue that it was Frank, Jerry, Richard or sometimes Caroll). His argument? "But she has a NEST! Why would a BOY have a NEST?" 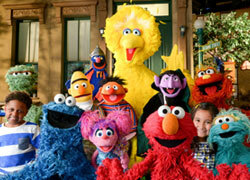 So...when you think about it...Big Bird is like one of those guys who still lives in his parents' basement! While watching MTM, my friend asked who played Miss Piggy. When I told him Frank Oz, he freaked out, couldn't handle it, lol. Mainly because he was a major Star Wars fan and could only think of him as Yoda, lol. I said to him, "I thought you knew that..."
He said, "No! Why would I know that?" I replied, "Everyone knows that!" Of course one should never assume. We all make mistakes.